Did you know that it’s Veganuary? During the month of January, families across the UK stave off meat and dairy products in order to limit their impact on the environment. Veganism is a way of living which doesn’t involve the consumption or use of any animal products, including those that have been tested on animals. A 2018 study, carried out by Oxford University and published in the journal Science, found that without meat and dairy consumption, global farmland use could be reduced by 75%, with farms still providing enough plant produce to feed the world. What’s more, the meat and dairy industries provide just 18% of the world’s calories and 37% of its protein – though they use the majority (83%) of farmland. In fact, the UN has said that a global shift towards a vegan or partially vegan diet is necessary to combat the worst effects of climate change. The environmental impact of meat and dairy production is one of the main reasons why veganism has become so popular today. Approximately 7% of UK citizens identified as vegan in 2018; in 2016, just 1% of the population followed a vegan diet. There are lots of misconceptions about how healthy veganism is for young children, but with proper planning, it’s perfectly safe for parents to raise their children on a plant-based diet. It’s also an opportunity for young children and their families to adopt the principles of healthy eating – and every small scientist needs nutritious food to fuel their curiosity! If you’re raising vegan children, you’ll need to make sure they’re getting enough calcium, vitamin B12 and vitamin D (these are commonly found in animal products). And since vegan diets tend to be high in fibre with fewer calories, it’s important that your child eats enough each day. It’s typical for young children on plant-based diets to take nutritional supplements; they’re also likely to need protein-rich, plant-based packed lunches for school. When making changes to your family’s diet, it’s worth visiting your GP or a qualified nutritionist; they’ll be able to offer practical advice on managing mealtimes. The NHS has released guidelines about feeding vegan babies and children too. And there are plenty of opportunities to reach out to other parents who are bringing up their children in a similar way, both online and in the local community. The Vegan Society provides local and group support for families across the UK, which is especially useful if you’re new to veganism. Dairy replacements like plant milk, vegetable spread and dairy-free yogurts and cheeses. Calcium-fortified dairy-free milk can be given to children from the age of one, but rice milk isn’t suitable for children under five. Plant-based protein sources. Pulses, beans and peas, or products made from these (including tofu and tempeh – both are made from soy), are all great sources of protein when you’re following a plant-based diet. Nuts and nut butters are also packed with plant-based proteins. Think of proteins as essential building blocks; they build and repair your cell tissues. In fact, protein is a component of every cell in your body. Grains such as brown or wild rice, oats, quinoa, whole-wheat cous cous and whole or multi-grain eggless pastas. Grains are important sources of fibre, B vitamins and minerals (including iron and magnesium). Fibre is vital for our digestive health, whilst B vitamins are involved in a number of important functions in our bodies. B vitamins help to break down and convert nutrients into energy. B6 is also involved in the production of red blood cells, which carry oxygen around our bodies. For cooking, use vegetable oils (like extra virgin, rapeseed or sunflower oil) and vegetable stock or vegetable bouillon. Agar is a great vegan substitute for gelatine and nutritional yeast – which is also packed with vitamin B – can be used in soups, sauces or even sprinkled on salads. When baking, you’ll need egg replacer (flax seeds or chia seeds can also be used in place of eggs). 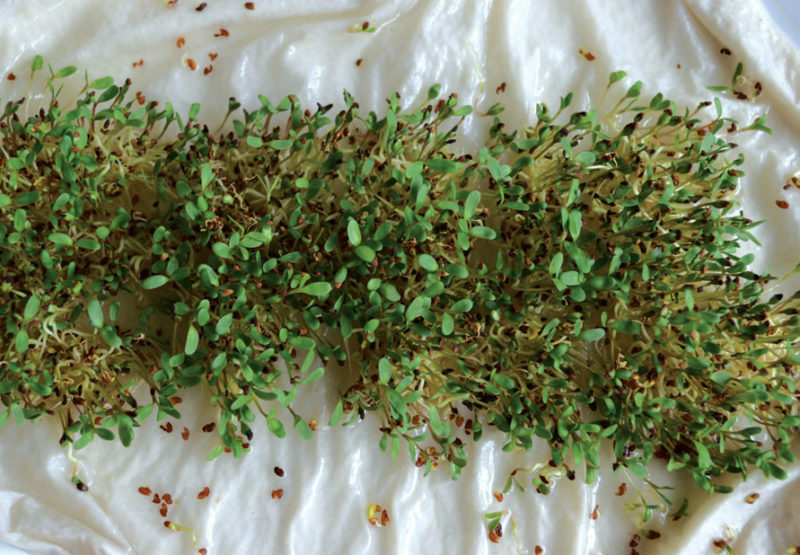 Chia seeds are great for adding to porridge or salads too. Containing fibre, omega-3 fatty acids and protein, they are digested relatively slowly; they provide a long, slow release of energy that helps to stabilise blood sugar levels. Coconut oil can be used as a butter substitute and agave or maple syrup are perfect replacements for honey. We’ve said it before and we’ll say it again; cooking is STEAM learning (that’s science, technology, engineering, art and maths – talk about a pot full of opportunity!). 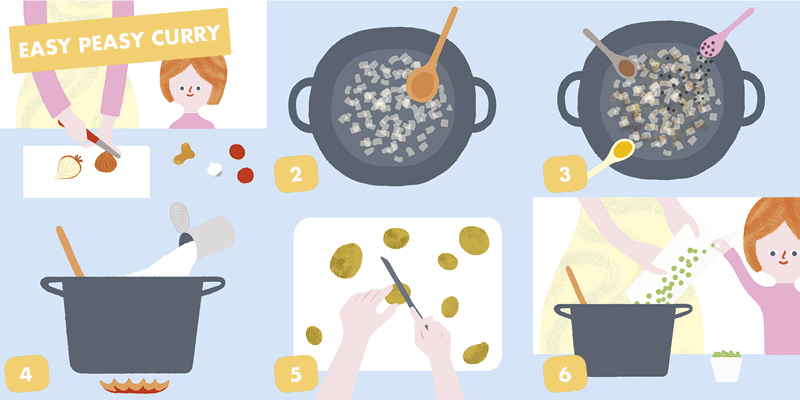 Whether you’re baking a (vegan) cake or rustling up a mid-week family meal, cooking is basic chemistry. 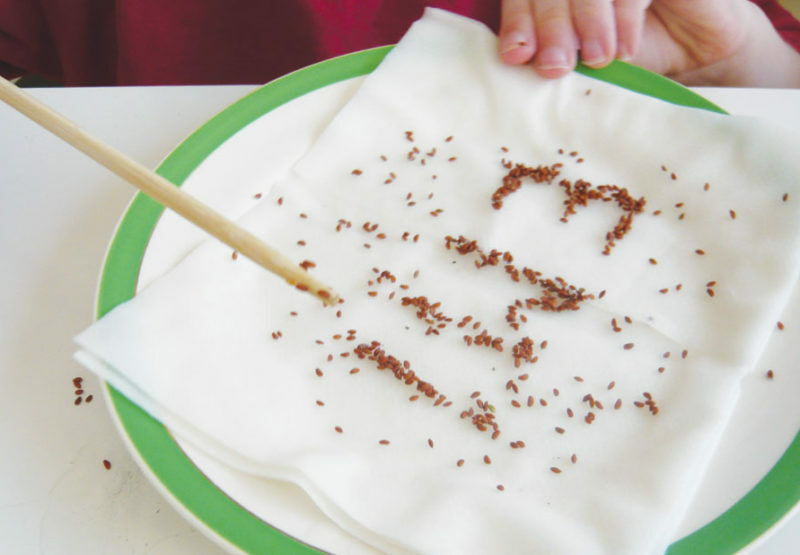 It’s a great way to introduce your child to the mathematical concepts of weighing, measuring and sorting. The communicative aspect of cooking together – and following a recipe – aids a child’s literary and linguistic development too. A 2013 study found that cooking with children can also promote healthy eating habits. Of the two groups tested, the children who helped their parents to prepare meals ate more vegetables than those who hadn’t cooked. 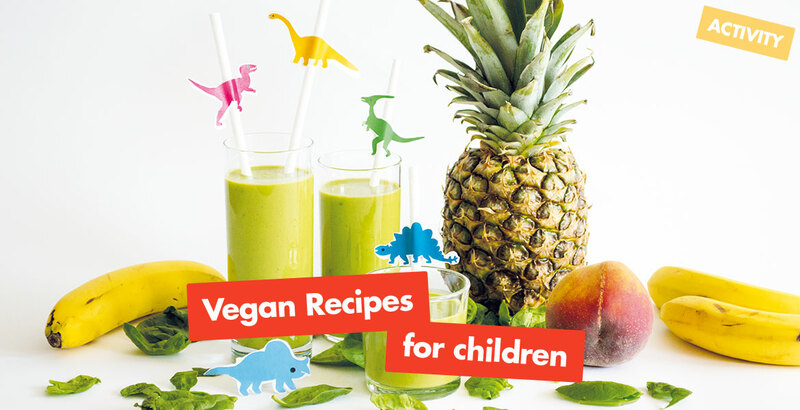 These simple vegan dishes are perfect for your child’s lunch box or family meal times. 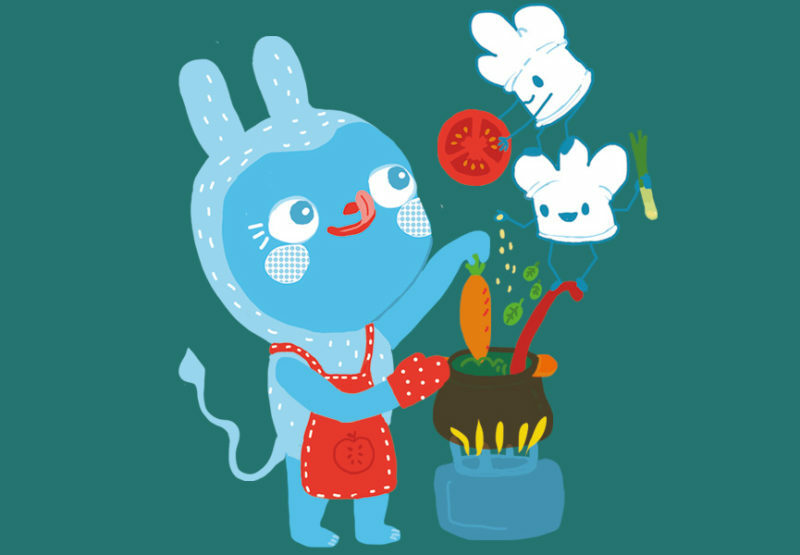 And remember, cooking is a great way to help your child’s cognitive development – so have them help out. Bread is a staple of most diets because it contains carbohydrates, which our body uses for energy. Think of your body as a car; carbohydrates provide the fuel needed to keep it functioning properly. And since it’s traditionally made from yeast (a fungus – not an animal product), flour, water and salt, bread is vegan-friendly. Make your own freshly baked tiger bread rolls by following the recipe below. Be sure to knead your dough; it helps proteins in the flour (which bond together when water is added) to interact with each other more strongly, so they line up to form giant chains. These chains trap gas released by the yeast, which makes the bread rise. These gases are then released when the bread is baked, which is why you’ll find air bubbles in your bread rolls. Dissolve yeast and sugar in the water, then add the flour, oil and salt. Mix together into a dough. Knead the dough until smooth and elastic (about 30 kneading movements). 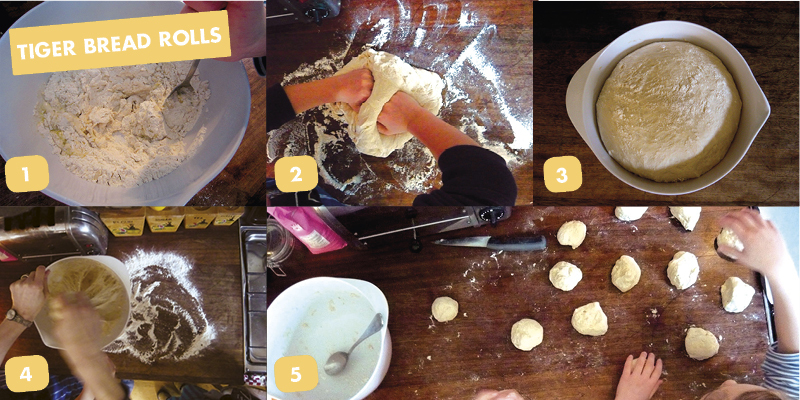 Shape the dough into a ball and place in a bowl. Cover with a clean, damp cloth and leave it to rise in a warm place for about 1 hour. After the dough has risen, flatten it. Give the dough another knead. Create roll shapes. Make some tiny balls and press two firmly on each roll shape for ears. Cook at 200 degrees centigrade for 20 minutes. Then remove from the oven and leave to cool on a rack. Draw faces with an icing tube on each roll! Fill your tiger bread rolls with one of Messy’s favourite tasty vegan sandwich fillings. Why not try a creamy avocado filling, which is full of healthy fats and vitamins (including vitamins C, E, K and B6). To make, simply chop or mash one avocado onto your bread before adding houmous and cucumber. You could add mashed chickpeas, salad leaves, a sliced tomato and vegan mayonnaise or mashed avocado to your bread rolls for a tasty lunchtime treat. If you’ve got a sweet tooth, try vegan-friendly PB&J (peanut butter and jelly) sandwiches, using gelatin-free jam. This Easy Peasy curry recipe contains nothing but healthy vegetables and a can of coconut milk (a great dairy-free alternative). Hearty and delicious, it’s mild enough for young Messy fans to enjoy. Green peas are a good source of vitamin K (which is important for healthy bones). Peas and potatoes are both good sources of vitamin C; an essential nutrient known to support cell and immune health. To rustle up this one-pot vegan recipe, follow the steps below. 1 tsp garam masala or mild curry powder. 3 cups of frozen peas. Finely chop the onions, garlic and ginger. Heat a large saucepan and fry the onions until soft. Add the garlic and ginger and fry for 2 more minutes. Add the mustard seeds, garam masala and tumeric to the onion mix. Add the can of coconut milk with another can of hot water. Bring to the boil. Cut the new potatoes in half and add to the curry. Simmer for 20 minutes or until the potatoes are just cooked. Add the frozen peas and cook for a further 3 minutes. Fun tip: make a slide with some card and let the peas roll into the pan! 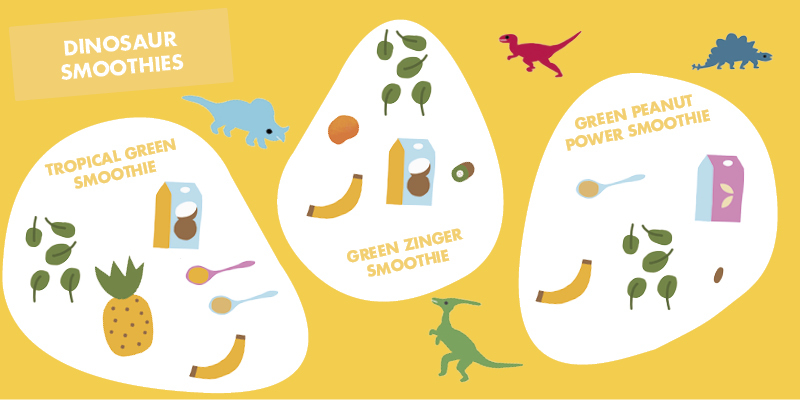 We all know that dinosaurs were big and strong; these RAWWsome smoothies are full of healthy greens to help young children grow just the same. Spinach is a high-fibre leafy green vegetable that’s full of essential vitamins and minerals, including iron. Iron is used to make healthy red blood cells, which carry oxygen and nutrients throughout your body. If you don’t have enough iron in your diet, you’ll feel tired and under the weather. And bananas are high in potassium, which boosts brain power. Put all of the ingredients in a blender and blitz for 10 seconds. Sweeten your tropical green smoothie with agave syrup instead of honey to make it vegan-friendly.